It’s almost twice as big as the original Queen Mary and over twice the size of Queen Victoria. QM2 weighs 151,400 tonnes and is 345m long, 41m wide and 65m above water level (about the height of a 23-storey building). It can accommodate 2620 guests and 1253 crew. There are 14 bars and clubs, 10 cafés and restaurants, eight luxury shops, four outdoor swimming pools, a spa with hydrotherapy pool, and many outdoor sporting areas including a putting green, half-size basketball court and a jogging/power-walking deck that goes right the way round the ship. Note to future passengers: do not dawdle on this deck or you’ll get mowed down by energetic elders. On a style note, the QM2 reflects the Art Deco heritage of the golden age of sea travel, typified by the transatlantic passage from Southampton in the UK to New York. Its exterior is painted stately black and white with a red pinstripe, making it one classically elegant ocean liner. Inside, the decor features walnut panelling, patterned carpets and massive chandeliers. My suite was described as a “Premium Balcony (Sheltered)”. It was suite 6052 on the port (left) side of deck six towards the bow, which I thought would give me land views as we cruised from Darwin. After about an hour watching a blurry stripe of orange coastline, we headed out to sea and didn’t see land again until we reached Bali. 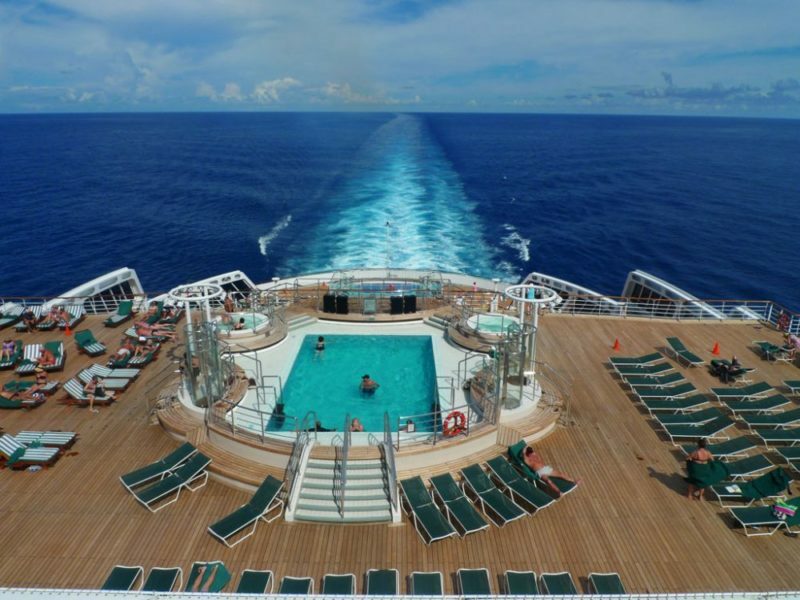 However, ocean cruising is what this ship was built to do. My cabin was compact but nicely laid out with a king-size bed, a “proper” bathroom including a shower and full-size toilet, and a small lounge area with a coffee table to rest your plates on when indulging in room service. The TV was small and had limited program options (mostly ’80s movies, international news channels and onboard promos – including a cute morning TV program, hosted by the ship’s entertainment director, called Wake Up With Keith, which featured the cocktail of the day and live interviews with entertainers and crew). But I spent most of the time “in” my room out on my enclosed balcony, leaning against the rail and watching the sea and sky change colour. On the plus side, the beds and pillows were comfy, the sheets were nice, there were welcome flowers and a bowl of fruit left in the room (including, surprisingly, a banana, something most seagoing vessels are superstitious about). There was also a turn-down service complete with chocolate on the pillow, and every deck had a personal steward who looked after any special requirements. My tip for anyone thinking about a trip on QM2 would be to book a room on deck eight or above if you can afford it, as the balconies in these suites have clear partitions allowing views out to sea even while you’re indoors. Decks four, five and six have enclosed balconies. While they may protect you from the wind, you can only get a good view if you are standing up near the rail. But if you’re on a budget you can always spend less time in your room and more out on deck. It was exciting to arrive at Darwin’s Fort Hill Wharf to see this imposing ship towering above me from dock level. In Sydney, the QM2 still seems huge, but it’s in scale with the surrounding high-rise buildings and Harbour Bridge; here, in Darwin’s port, where the relatively low-rise CBD isn’t visible from the wharf, the liner looked simply humongous. It was really quite intimidating – and exhilarating – wheeling my suitcase up the gangplank. Inside, QM2 was very much like a five-star hotel, complete with check-in desk. The only difference was that you had to hand over your passport as if you were boarding a plane. The handover was required not only because ships are international territory but because we’d be docking in Bali on day three of my journey. But back to Darwin: a sense of fanfare was evident in port as representatives from the local newspaper, NT News, handed out commemorative newspaper front pages with “Welcome to Darwin” along with an image of the ship. This convivial reception continued as the ship pulled out of port, with tugboats escorting us out of the harbour, spraying celebratory jets of water as we went. People on their own private boats also came out to see us off. I stood on my suite’s balcony, watching it all. There’s nothing like the thrill of setting off on an adventure, and on a cruise ship that sensation is amplified. To experience a grand ship like this, I was told you really need as many days at sea as possible, because it’s the only way you’ll get to explore it properly and try out all the activities. After experiencing four full sea days, I know that’s true. There really is no shortage of things to do (see “On-ship Activities”, next page). I know a lot of people below retirement age worry that they’d feel “stuck” on board a cruise ship and don’t like the idea of being inactive, but I didn’t feel that way. Admittedly, the average age of oceangoers seemed to be over 60 and I probably wouldn’t pay to go back before retirement age, but it was truly a lot of fun. And I do like the idea of cruising post-retirement – if my generation can afford to be that leisurely! I was worried about seasickness, but because the QM2 is a huge ocean liner, it is incredibly stable in calm waters. Indoors, you don’t really notice the motion at all. However, as we neared Fremantle the afternoon and night before port, even the QM2 got the wobbles. From a deckchair, I watched a cargo ship following a parallel course to ours. The ship felt a little rocky, but the other ship was really struggling. Every time it hit a wave the entire front half of the ship was submerged, then it seemed to lift up out of the water like a rearing horse. Docking in Fremantle was great, because the bridge crew had to navigate an extremely narrow channel, and little tiny tugs had to push the great big ship close to the dock. It has more than 8000 books and an extensive selection of magazines (including Australian Traveller!). For this circumnavigation cruise the State Library of NSW had loaned original logbooks from Matthew Flinders’ explorations, and librarian Paul Brunton was on board to give fascinating talks on Flinders’ trips on Tom Thumb. The library has club chairs pointed toward the bow, so you can sit, read and look up to meditate on where you’re going. There’s also a pretty cool bookshop with great general interest fiction and nonfiction, as well as specialist books on cruising – such as all the info you could need on the Cunard line, and a surprising number of publications about the Titanic, for the masochists on board. People staying in the superior suites have the privilege of a pool deck of their own, so they don’t have to mix with the masses. There is a little kids’ pool, a splash pool for the elderly and those who can’t swim and a main pool where you can enjoy the sun at the stern, watching the massive wake recede behind you. It’s such a contrast to go from indoors, where you inevitably spend most of your time, out into the open air and sunshine. Bliss. While most things are included in the tariff, it’s worth opening your wallet for a few exceptional exclusive experiences. Fine-dining restaurant Todd English is simply superb, as is the Commodore Club, a relaxed and chic cocktail bar with a humidified cigar lounge off to one side. It’s one of the places on the ship that feels as luxurious as you’d expect of the QM2. The Veuve Cliquot bar is pretty good too, for obvious reasons; you can do champagne tastings here. Canyon Ranch Spa Club is also worth a splurge for its lovely hydrotherapy pool and relaxing lounge areas for sea views away from the crowds. Actually, I had four favourite things. Illuminations Cinema is Art Deco in style with big comfy seats. It screens two movies a day free of charge – usually a classic and a new release. I am a cinefile so I saw a film every day, including Pirates of the Caribbean: On Stranger Tides in 3D. Happily, I could walk out of Terence Malick’s Tree of Life without feeling like I’d wasted my money. At certain times, part of the cinema converts into a planetarium, a domed ceiling onto which 3D movies about astronomy are projected. All of them seemed to be narrated by honey-voiced stars such as Morgan Freeman and Harrison Ford. Worth watching with your eyes shut, really. A little bar fridge houses a couple of soft drink options and mineral water; no food. But there is round-the-clock in-room dining, and loads of food at every turn, so it’s unlikely you’d feel like a between-meals snack. There were also no in-room tea- and coffee-making facilities. Sure, room service is included in the tariff but the freedom to have tea when you feel like it is dampened by having to wait for it. Every other luxury hotel seems to have one of those mini coffee machines these days, too. But not the QM2. There was a lot of food, and an excellent selection of cooked meals, salads and desserts, but I do not really enjoy self-serve meals in large quantities. Even on a top-end ship with lots of staff, there were spillages, crowds of people to manoeuvre around and a general feeling that you’re in a queue and have to rush to find a free table at peak times. Luckily, there were alternatives. You could dine à la carte for breakfast, lunch and dinner in Britannia Restaurant (for the lower-level suites) or the Queens Grill or Princess Grill for the more expensive staterooms. I think this would be true of me on any ship, but I felt jet-lagged onboard – slow, sluggish. Probably because we were so well fed! Every evening on turn-down, you receive a daily programme for the next day. Shortly after I boarded I wrote a list of things I wanted to do before I got off: see a live show in the theatre; do a lesson, such as flower-arranging or Photoshop; attend a lecture; visit the planetarium; browse the shops; have a high tea; swim; read on a deckchair; visit the art gallery (where there was a Rolf Harris exhibition); have an espresso martini at Sir Samuel coffee shop; and go to the observation deck at night. The only thing I didn’t do was get outside at night. I was just too busy! The lecture program is sensational. As well as the Flinders lecture, talks were conducted by maritime historian Chris Frame (who spoke about QE2’s role in conflicts, such as being in service during the Falklands War), oceanographer Dr Denny Whiford (who spoke about different types of ocean waves) and social entrepreneur David Bassau (who talked on microfinance and foreign aid). I’m just upset I didn’t get to play deck quoits. We pulled into port at Padang Bay, Bali, first thing in the morning and were transferred to shore on tenders (which double as lifeboats – argh!). I put my name down for a Bali Highlights tour that took us to active volcano Kintamani and Batur Bay. We also did a whirlwind tour of Bali’s cultural sites – a wood-carving shop, a rice paddy, a temple and a dancing demonstration. It was wonderful, and I do love Bali, having visited many times – but I wondered whether it is due to the size of the ship that guests couldn’t have experienced Western Australia’s coast instead, such as Broome and the Kimberley. I can understand if there are environmental concerns and a lack of infrastructure, but it would have been nice if the circumnavigation of Australia had allowed overseas guests to experience our coastal “outback”, because it is so unlike anywhere else. Maybe Broome’s wharf is too shallow for such a large ship, I’m not sure. Each category of suite gets its own restaurant to dine in at night – I ate in the main dining room, Britannia Restaurant, which seats 1347 guests over two sittings. There are also two exclusive restaurants for the highest-grade staterooms – the Queens Grill (200 seats) and Princess Grill (178 seats). There are 10 restaurants and cafés. Kings Court Buffet has casual dining for breakfast and lunch, but trickily converts into yummy speciality dining at night – La Piazza for Italian, Lotus for Asian fusion, The Carvery for British staples and the Chef’s Gallery (a demonstration kitchen). Fine-dining restaurant Todd English is designed by the eponymous Boston-based celebrity chef. It’s Mediterranean cuisine with a twist, in a lovely setting. At the other end of the spectrum, the Boardwalk Café is outdoors and serves quick bites. Recommended: high tea is served silver-service-style in the Queens Room, a large ballroom. I was lucky enough to be onboard the ship’s first Royal Circumnavigation tour of Australia – a 28-day trip that took in the following ports: Sydney, Brisbane, Whitsundays, Yorkeys Knob (Cairns), Darwin, Bali, Fremantle, Adelaide, Melbourne and back to Sydney. It was a bit of a shame that the tour skipped Tasmania – even Commodore Christopher Rynd seemed disappointed by this in a Q&A with his passengers. Darwin to Fremantle via Padang Bay, Bali. Duration: Six nights. Number of cabins: 1310 staterooms. 1017 outside doubles; 293 inside doubles; 955 balcony rooms (equalling 73% of cabins). 30 rooms are available for disabled guests, with wheelchair access, wider doors and adapted toilets. There are also facilities for blind guests, including braille and tactile signs. There are 10 different styles of state room: top of the line are the Grand Duplexes – the most luxurious suites at sea, comprising 208m2 of living space with a large, clear-sided balcony offering sea views, fully stocked bar included in the tariff, dining area seating eight, dressing room, plasma TV, home office, exercise equipment, two marble dressing rooms and a whirlpool bath. At the opposite end of the spectrum, Standard Inside cabins are 18m2 and have king or twin beds.